It’s the late 1930s in Memphis Tennessee and “The King Of The Delta Blues Singers” is reigning in the dingy juke joints. Sadie, the daughter of the Devil himself, has a signed contact with him that’s come due. She’s got a soul to collect. In a blues club on Beale Street, Sadie finds him on the stage and waits for him with a bottle of bourbon, ready to take him to hell. But what happens if he doesn’t want to go? Daddy’s little girl, Sadie, like all spoilt children always gets her way. Except that Daddy is the Devil so her games tend to be deadly. Sadie is a dangerous and curvaceous chameleon that stalks through time and place to collect her chosen prey, the talented musicians of the world. Performers that would sell their very soul to achieve the success they yearn for. 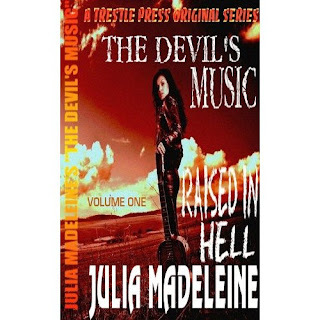 Trestle Press author Julia Madeleine brings us a deliciously descriptive tale. She sets the scene well and entertains throughout this enjoyable tale. A Great read.